Audi Q5 Interior, Sat Nav, Dashboard | What Car? Every version of the Q5 has a height-adjustable driver’s seat and a height and reach-adjustable steering wheel. The seat keeps you gripped securely in place through corners and you get four-way electric adjustable lumbar support as standard along with extendable seatbases. These things make it easy to fine-tune your driving position, but if that’s still not enough, eight-way electrically adjustable seats are on the options list (and standard on the Vorsprung and sporty SQ5). 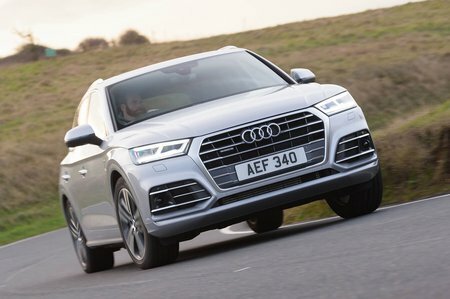 It’s not just comfort the Q5 does well; the clarity of the instrument dials (which are digital if you add the optional Virtual Cockpit) and the clearly labelled, logically positioned dashboard buttons all make the Q5 remarkably stress-free to operate when you’re on the move. It’s easy to see out of the Q5. For starters, the windscreen pillars are chamfered, so they don’t obscure your vision too much through bends, and large door mirrors give a great view of what’s coming up alongside you. Bright xenon headlights are standard on the cheaper trims, while the posher trims come with even brighter LED headlights. You can add optional Matrix LED headlights – these are well worth thinking because they cleverly allow you to use main beam without dazzling oncoming drivers. As with many modern cars, the rear pillars are pretty chunky. But because Audi’s Parking System Plus comes as standard – that’s front and rear parking sensors in non-Audi speak – this doesn’t present too much of an issue. You can also add a rear-facing or 360deg, bird's-eye-view camera to further alleviate any parking woes (the latter comes as standard with range-topping Vorsprung trim). 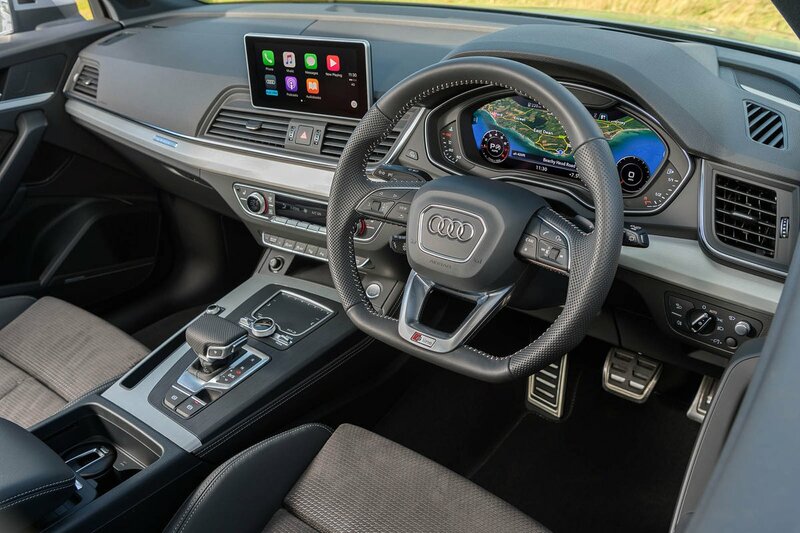 Audi’s MMI infotainment system, with its rotary controller and simple shortcut buttons, is so much easier (and safer) to use on the move than rival touchscreen systems, such as those fitted to the Volvo XC60 and Jaguar F-Pace. Only the BMW X3’s iDrive system is similarly intuitive. The high-mounted 7.0in screen has crisp, high-resolution graphics, making it easy to see when you’re navigating the menus. 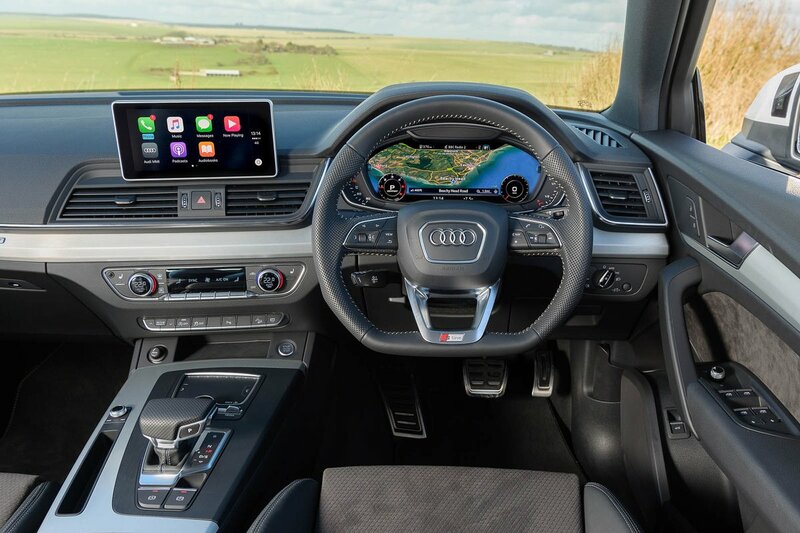 Every Q5 has sat-nav along with smartphone mirroring for Apple and Android phones, which allows you to use selected phone apps through the system. A Technology Pack (standard on Vorsprung trim and optional on the rest of the range) adds MMI Navigation Plus, which brings Google Maps with Streetview, onboard wi-fi and a larger 8.3in screen. You also get wireless phone-charging and a 4G internet connection with this package. The Technology Pack pack also brings Audi’s Virtual Cockpit system. This replaces the standard instruments with a 12.3in display that you can configure in multiple ways to put lots of information, including navigation maps and phone contact lists, right in front of you. Audi has a habit of showing other manufacturers how to make cars look and feel fantastic inside, and the Q5 is a prime example. Press something that’s meant to move, such as a switch, and without exception it will click precisely. Press something that’s not meant to move and it won’t, because its interior fixtures and fittings are very robust. They're tactile, too, with dense, soft-faced materials in prominent locations and harder plastics generally kept out of sight. All models come with part or full-leather seats as standard and you can add ambient lighting (standard on the Vorsprung) that bathes the interior at night in your choice of 30 colours. It’s not just inside that the Q5 feels solid, either. Close a door and you’ll hear a satisfyingly thunk, while all the panel gaps appear to be millimetre-perfect. Only the X3 gets anywhere near to matching its ultra-high standards.